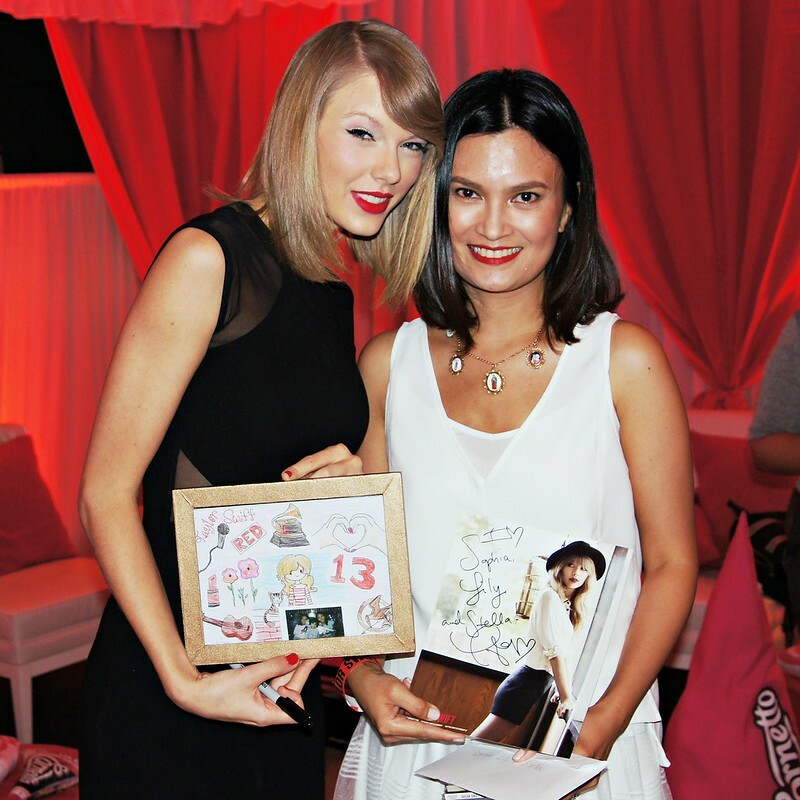 With Taylor Swift at her exclusive Vibe Room party before the Manila concert June 6, 2014. Photo courtesy of Taylor Swift’s management group. 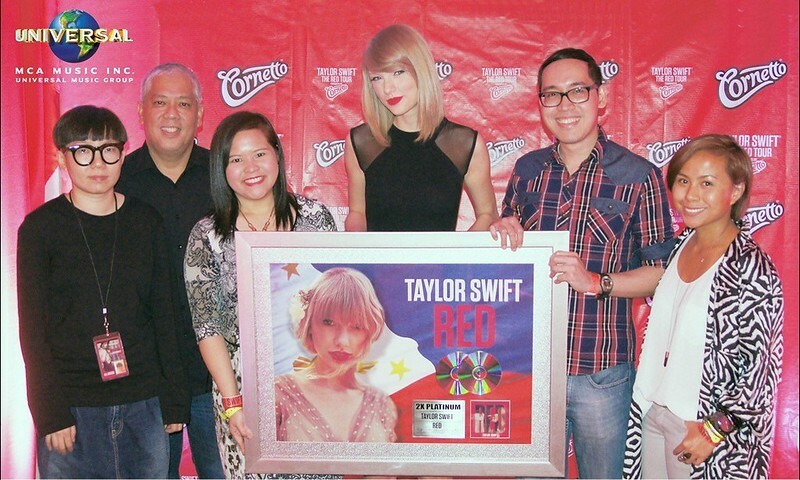 Thanks to MCA Music Philippines for this amazing opportunity. It’s no big secret that my girls and I are big fans of Taylor Swift. 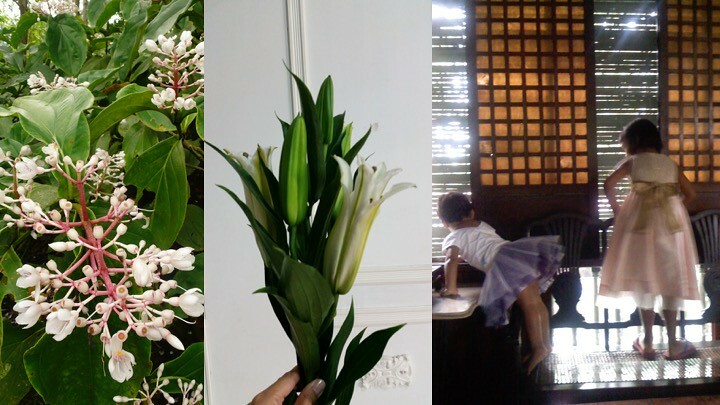 My old blog has this story documenting Lily’s love for Taylor since she was a toddler. 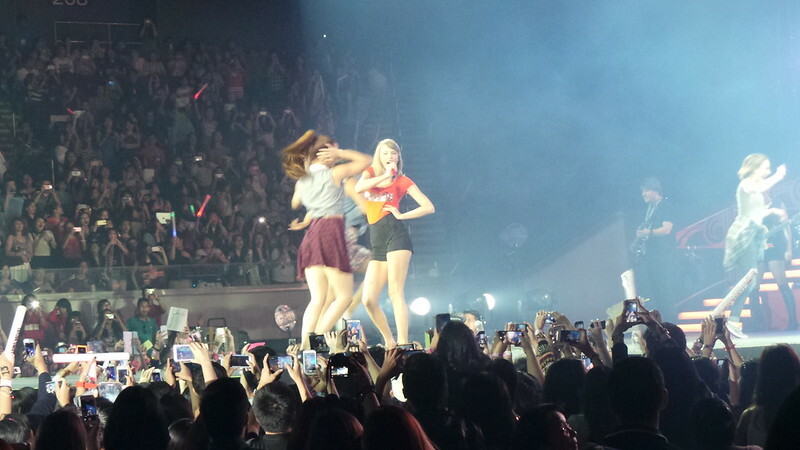 In 2011, I went through so much just to buy tickets for Sophia and Lily to watch Taylor Swift in Manila. And Lily, who was only 4 years old then, fell asleep after the first song because it was past her bedtime. This time, I couldn’t find any tickets for me and my girls. Tickets sold out within minutes. Last week I got a phone call from MCA Music Philippines’ Melissa Juco. She asked if I was available on Friday, June 6th to attend Taylor Swift’s super exclusive Vibe Room / Tea Party just before the concert. I shrieked. The kids heard me. And so began the heartbreak and disappointment. Lily said, “Why you? I’ve loved her my whole life.” There was just no way I could have even tried to bring my kids to this exclusive meet & greet with Taylor Swift. 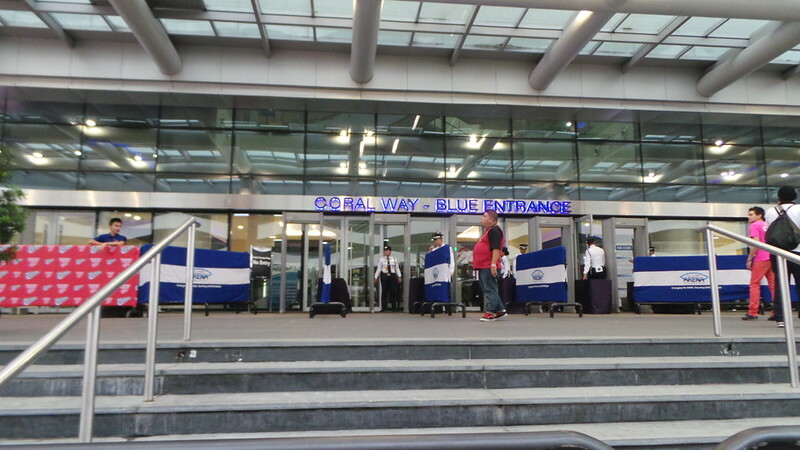 Security checks, accreditation, confirmation. There were only 12 media guests invited. It was very special. I promised them I’d try to get Taylor’s autograph for them. Last Friday we were told to be at MOA Arena by 5PM. The text said, “Please be prompt.” I was there at 5pm on the dot. The gates didn’t actually open til 5:30. So I stood by the ramp and waited. 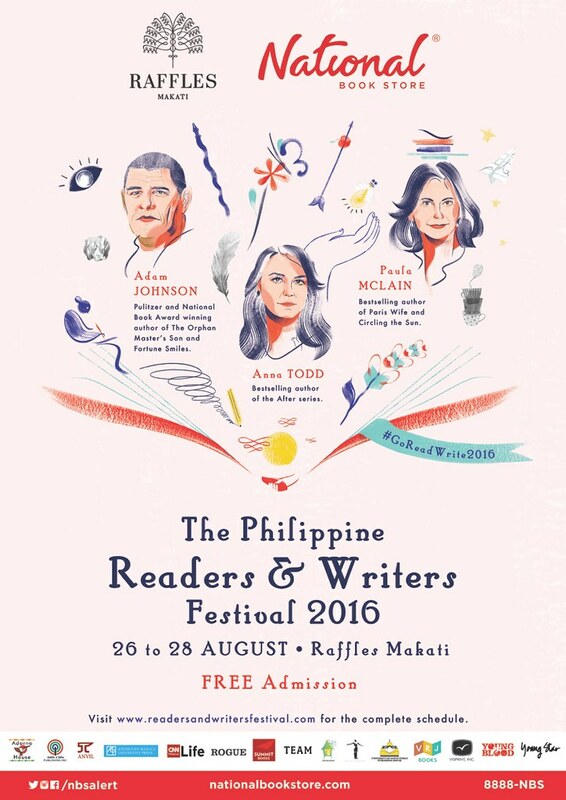 There I met Jill of Inquirer Super. She’s the one with the multi-coloured hair. 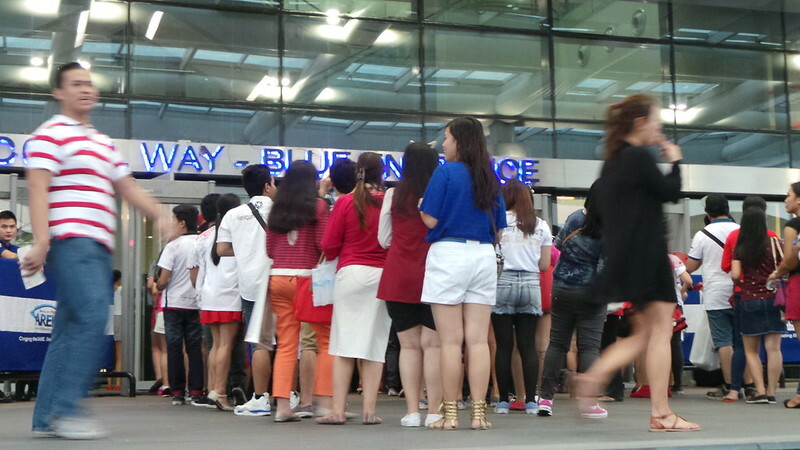 By 5:45 we met the MCA Music Philippines managers and they brought us inside the building. I’m so glad I was prompt. Because as soon as we went through the gates, we were whisked upstairs to get backstage. There was no time to wait for other media guests. Some were left behind. 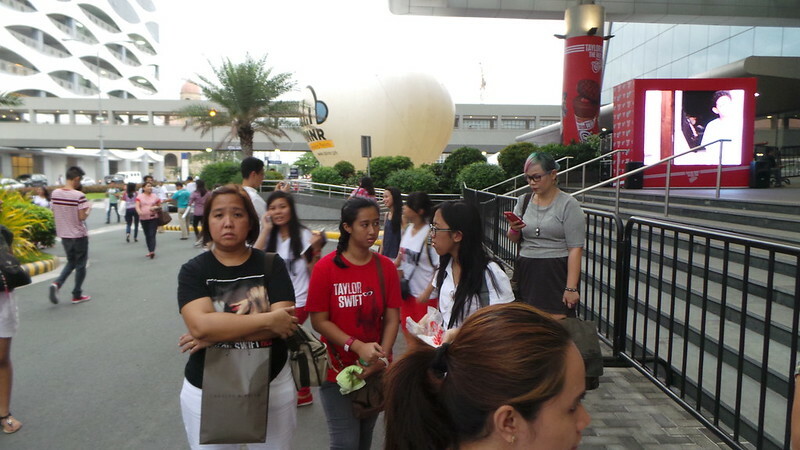 The walk towards the backstage of MOA Arena. Footwear was an issue for me. 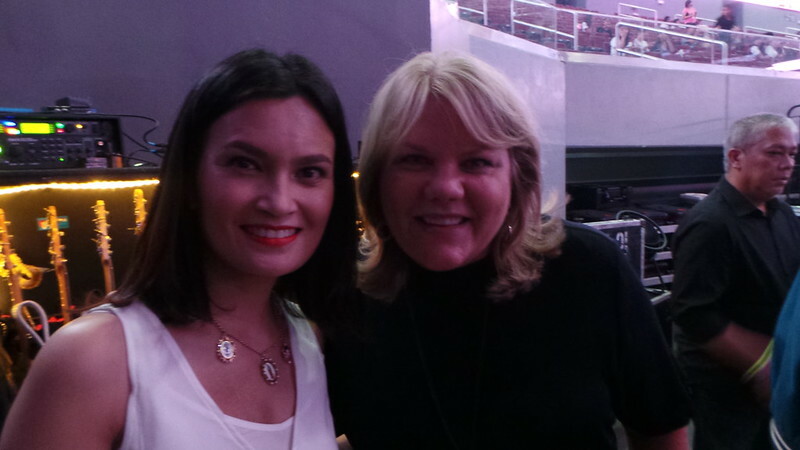 I wanted height because… well, I was meeting Taylor Swift! But I didn’t know if we’d go straight to the concert or if there would be time to change shoes in between. 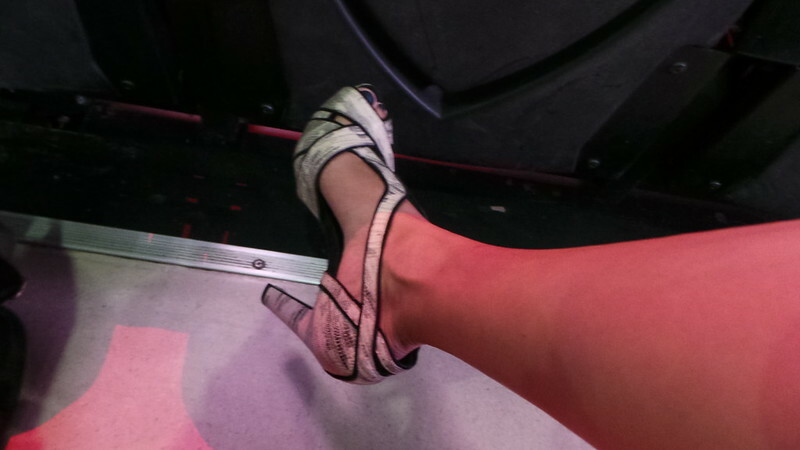 So I wore my most comfortable heels – these are from Tory Burch. I had flats on standby with my driver, but I couldn’t go out to meet him and change shoes anyway. So ya, I was that girl in high heels during a concert. Haha. 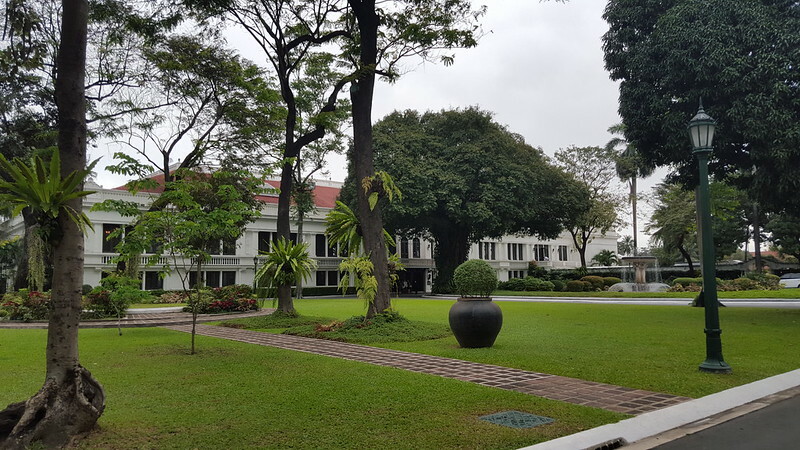 There was a lot of security – X-rays, metal detectors, body guards both local and foreign. We entered the Vibe Room, which is basically a tent beside the technical backstage. There was a lot of red – fabric, pillows, lights. Inside, the mood was very relaxed, security faded to the background. 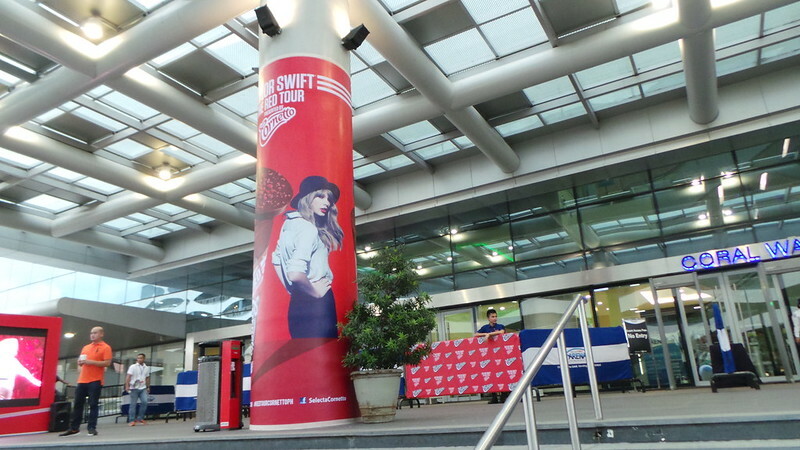 Taylor Swift’s management rep came out to host us and offered us food, drinks and Cornetto. They advised us to spread out to different parts of the tent so that Taylor could move around and get to talk to each of us alone. We were not allowed to take pictures ourselves though. They said Taylor’s official photographer will shoot the photo. I brought these drawings with me. Sophia, Lily and Stella each drew a Taylor portrait. Then wrote a letter in the back. I put a Fuji polaroid of them holding up Taylor standees which I took minutes before I left the house. They were all in stripes in homage to Taylor. It took a quick 10 minutes at the Viber Room, then Taylor Swift entered the room together with a woman I quickly recognised as her mother. I knew she was Taylor’s mom because of my favourite video – Best Day. I smiled and waved at her mom like we were long lost friends, and she said hi back. Then I zeroed in on the tall, skinny, blonde-haired super star. She looked exactly like she does in her videos. Just like a living doll. Taylor wore a, pardon the pun, tailored little black dress with mesh cut outs on the sides to further emphasize her already unbelievably small waist. She had peep-toe black pumps with the cutest sabrina heel. Taylor started to work the room to meet all of us one by one. I didn’t want to go first. I wanted to observe. 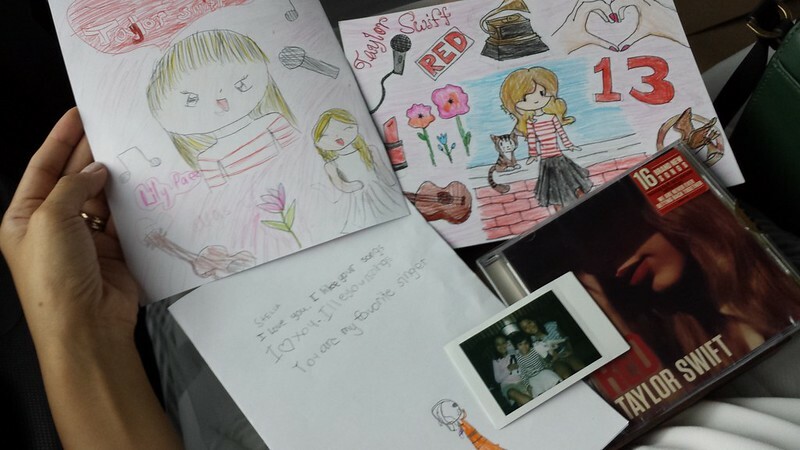 I had to measure up if it was appropriate to give her a gift from my daughters – their drawings of all things Taylor Swift. The conversations worked like a formal reception line except that we were not in a straight line. Some interactions were faster than others. After introductions, she would ask questions, or the journalists would volunteer Taylor fan anecdotes from the radio, the music channel or the papers. It was not an interview or a press conference. There was a lot of laughter and jokes. She’s really charming. She even got a bit dorky with one of the record label managers. She signed one 8×10 poster for each. Then posed for a souvenir photo. Then it was my turn. She walked towards me, extended her hand. We shook hands. I told her my first name. Me: Thank you. I make these. I’m also a jewellery designer. TS: (Still looking at my neck piece, then looks right into my eyes). It’s really beautiful. TS: Hey we have the same hair. So then I told her a little bit about what I do – TV and this website… that part got awkward. So then I found my opening to present her with my daughter’s gifts. Me: Taylor, I have three daughters and they are all big fans of yours. They made some artwork for you and asked that I give them to you. TS: Oh wow. Thank you. Are they coming to the concert? Me: No they’re not. Your concert sold out within minutes. But they watched your first concert in 2011. Lily was just 4 then. TS: Oh cool. Well at least they’ll have a story to tell now. (Then she looks at the art work. Sophia’s drawings were on top.) Wow they are really so good at drawing. So creative. My goodness. Look at that, she drew my cat. My outfit. They’re really good artists. Thank you for this. (Then the small box of art leaves her hands). Do you want me to sign the picture? Me: Yes please. For Sophia, Lily and Stella. TS: They such pretty names. (She signs). Do you want to have a photo with me? Me: Yes please. Is it ok if we have the photo with my daughters’ works? They would be so thrilled. Me: By the way I was star struck with your mom too. I think she’s awesome. I know her from your song Best Day. TS: Oh she’d get a kick out of hearing that. Me: Thanks so much for all this. TS: You’re welcome. And I love your dress. I really do. Precious gift for my daughters. 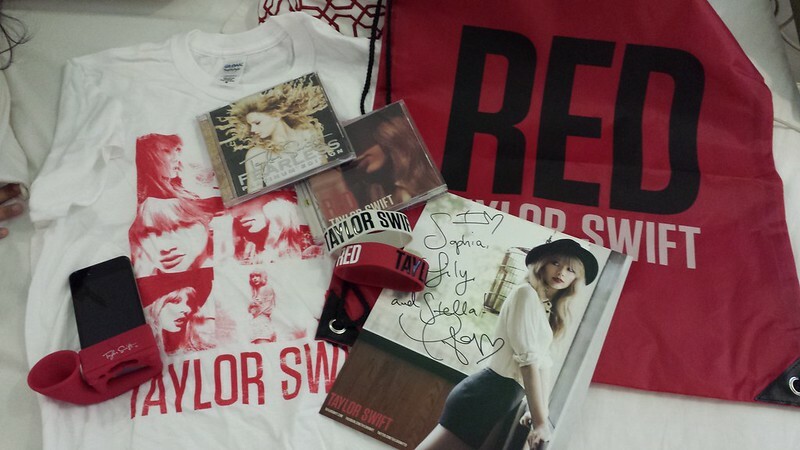 Thank you Melissa Juco of MCA Music for the invitation and exclusive goodies from Taylor Swift. I actually bought two new Taylor Swift CDs (our old ones are dogeared) before meeting her but I got so flustered by all the compliments that I forgot to have her sign them. Taylor Swift’s mother is Andrea Finlay but everyone calls her Momma Swift. One of the reasons I like Taylor Swift so much, aside from her songs, is that she has a great relationship with her parents. She wrote Best Day to surprise her mom one Christmas. To my mommy readers, if you haven’t seen this video yet, you must. And let me know what you think. Because it is an anthem in our house. 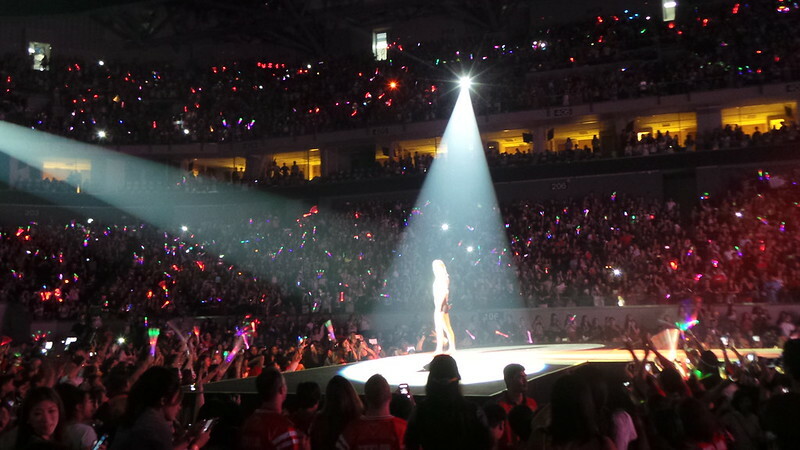 The RED Tour has been going on for 16 months. They had 67 dates in the US alone. 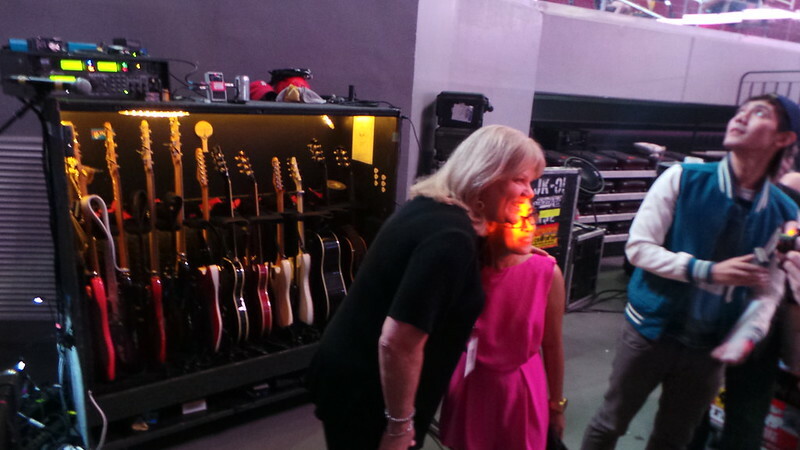 They are on the tail end of the RED Tour. She was wistful when she said this. They have 75 people working with them full time for this tour. And wherever they go, they hire about 200 more local staff – from security to technicals. The video wall has over 4 million pixels. She conceptualizes her own videos. During the live show there are 12 camera angles with 2 permanent ones focused on her. There are 7 costume changes in the RED tour. The fastest one is 3.5 seconds during the song Trouble. 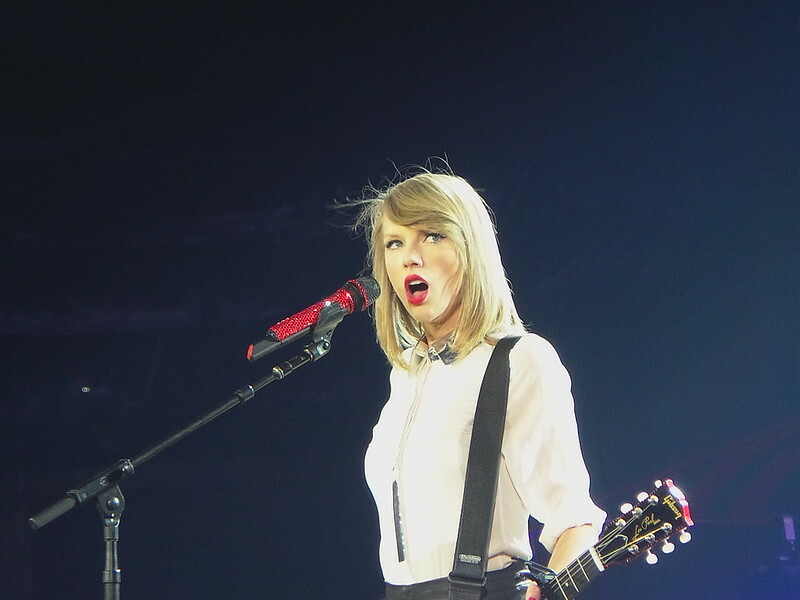 Taylor likes has a theatrical approach to her shows. This love for theatre and grand costumes date back to when she was 7 or 9. She was into theatre productions at school. Her grandmother is an opera singer. Taylor learned the guitar and started writing her own songs at 12. Mama Swift initially wanted Taylor to be a horse rider. Taylor plays four instruments at the show – banjo, piano, 7 electric guitars and 6 string guitars. Taylor never lip-synchs in her concerts. Even if she’s sick. This was the only part where we could take photos backstage. Look at all the guitars! Since she said we had the same hair, I started obsessing over her hair. I think I need a fringe. In the middle of the song, she changed into this. Within 3.5 seconds. 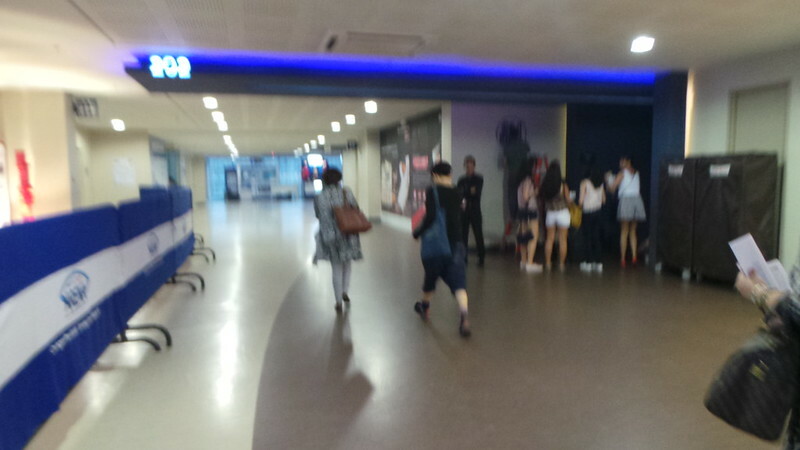 The fans were predominantly girls. I wished my daughters were with me. But I was happy that I got them an autograph. Love Story was ballerina and princess inspired. Great concert. 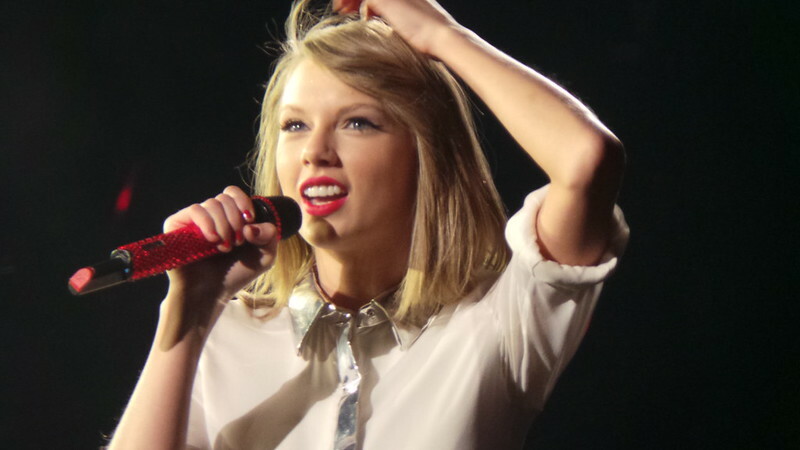 We love you Taylor Swift! yes me too. we keep playing her songs and videos. haha. oh no. really? what songs would you have wanted? I was hoping for “Begin Again” and “Everything Has Changed” although the latter was really unlikely as she only seemed to sing that with Ed Sheeran. Yeah, the acoustic set was nice, even the initial gaffe with the capo. Yes. that was totally charming. My 3yo shrieks when she sees TS on TV ands in the mall! We love singing along with her Trouble song ever since hearing it on the VS Fashion Show!